Japan, an archipelago consisting of four principal islands situated off the east coast of the Asian mainland, was a relative latecomer in terms of both receiving from the outside and nurturing at home a rich and sophisticated material culture. Whereas ample archaeological evidence exists in China of extant garments, ceramic sculptures, and tomb paintings, giving a credible view of Chinese costume history across several centuries before the advent of the Common Era, a verifiable history of Japanese dress does not begin until the eighth century C.E. Southeast Asia, Central and North Asia, and possibly Polynesia. Native textile fibers were processed from the inner bark of trees and plants, and weaving was done on a backstrap loom. Textile technology continually advanced as the result of immigration, with the production of silk presumably established by the third century. Silk remains the fiber of choice for traditional Japanese dress. The archaeological record in Japan yields little in the way of human imagery until the fifth century C.E. Prior to that time representations of stick figures found on pottery shards and bronze bells allow for the hypothesis that a long tunic-like garment, belted at the waist, may have been a common form of dress. In the fifth and sixth centuries, large quantities of haniwa, terra-cotta tomb sculptures, were produced for important burials. Male figures are often depicted wearing tight, body-hugging, long-waisted jackets flared at the sides with long tubular sleeves and baggy pants secured with ties just above the knees. Such garb is reminiscent of the practical wear of horse-riding, nomadic steppe peoples from the Asian mainland. The horsemen required full mobility of arms and legs to guide their mounts and tightly fit garments for warmth in the cold, wind-swept northern latitudes. Loose-fitting, wide-sleeved, floor-length Chinese robes, the other dominant elite mode of dress on the continent, were the antithesis of this kind of nomadic clothing. Typical female haniwa figures wear an upper garment resembling the men's jacket and a skirt, rather than trousers. It is important to note that haniwa jackets tend to be fastened in a sequence that places the right front panel over the left panel, after which the ties are secured at the right side of the jacket. This was considered a barbaric practice by the Chinese, whose robes were closed left side over right. Japanese dress was to mimic the Chinese mode in this and in other ways soon thereafter. It is doubtful that haniwa dress was widespread in Japan during the fifth and sixth centuries. Such dress would not be suitable for Japan's long months of warm and humid weather, and a life on horseback would have been unlikely in mountainous Japan. Judging from the large number of extant haniwa horse figures, a horse-riding elite may well have established itself in Japan during this period, perhaps after an incursion from the Asian mainland, but their way of dressing was not to prevail. The year 552 is considered the official date for the introduction of Buddhism in Japan and marked the first year of the Asuka period (552-710). Buddhism had its origins more than a thousand years earlier in India, spread to China by the beginning of the Common Era, and finally reached Japan by way of Korea. One of the important cultural advances that arrived with Buddhism was literacy. The Japanese employed the Chinese writing system based on ideograms. Japan's native religion, Shintoism, coexisted with Buddhism, in keeping with a continuous theme in Japanese history of borrowing from the outside while preserving the most valued native traditions and ultimately transforming foreign ways into something uniquely Japanese. The history of Buddhist dress in Japan, as embodied in the religion's principal ritual garment, a patchwork mantle (kesa), illustrates the theme of importation and adaptation. Kesa are among the oldest extant garments in Japan. As the physical manifestation of Buddhist teachings, examples were brought from the Asian mainland in order to aid in the implantation of the religion on Japanese soil. In later times, certain kesa tested the limits of the garment's parameters in a uniquely Japanese way. Another early group of costumes in Japan were used during performances and ceremonies commemorating an enormous bronze Buddha completed in 752, midway through the Nara period (710-794). Dignitaries from various Asian countries came to Nara, then the capital of Japan, to attend. These costumes, along with most of the early kesa, have been preserved in the famous temple storehouse known as the Shôsôin. The Shôsôin performance wear is mostly left-closing and includes both knee-length sleeveless vests and long-sleeved full-length robes. Collars are either narrow and round or V-neck, with front panels that either abut or overlap. Both figural and geometric decorations, in either woven or dyed patterns, are part of the rich legacy of this diverse group of silk robes. Also included are trousers and accessories such as leggings, socks, shoes, and aprons. Other costumes in the Shôsôin include robes worn by craftsmen, similar in cut to the full-length robes with the round collars mentioned above, but in hemp rather than silk; robes with wide flaring sleeves; and even archaic, right-closing haniwa-style costumes. The Shôsôin costumes are very likely representative of diverse types of Asian dress then in use, and any number of them may well have been made outside of Japan. In later Japanese traditional dress, several of these early modes of clothing were to be reflected in the costumes of the No theater. According to period documents, dress at Japan's imperial court followed that of China's at this time, with rank indicated by color. Contemporary pictorial representations depict both male and female courtiers in long flowing robes with voluminous sleeves ample enough in length to cover the hands. A characteristic of male dress was a close-fitting, narrow, round collar, while female dress featured wide front panels that overlapped in the left-over-right sequence. Women's court dress also included one or more underrobes that closed in the same manner. Kyoto became the new imperial capital at the end of the eighth century, marking the beginning of the long and relatively peaceful Heian era (794-1185). Japan's previous periods of intensive cultural absorption from the Asian mainland was followed by the internal development and refinement of foreign ways combined with native sensibilities. A costume history of this period cannot be based on extant garments, as extremely few examples have survived. Knowledge of Heian dress is largely derived from pictorial representations, wardrobe records, and two of the earliest novels in world literature-the Tale of Genji, by Lady Murasaki Shikibu, and the Pillow Book by Sei Shônagon. The novels describe the insular world of the imperial court and its daily life full of intrigue, poetry, wit, romance, and a remarkably refined way of dressing. Women wore layer upon layer of silk robes, with only the edges of individual robes being revealed at the sleeve ends, collar, and hem, and the outermost robe setting the overall tone for the color scheme. A woman's taste and sensitivity was displayed by her choice of color combinations in selecting the various robes for the ensemble in accordance with the season, an occasion, or a prevailing mood. Further articles of clothing, such as a jacket, skirt-like pants (hakama), and an apron worn at the back completed women's court dress. The robe, presumably worn closest to the body in this ensemble, is considered the precursor to the Edo period (1603-1868) kosode in terms of construction and shape. This innermost garment had an overall T-shape composed of square- or rectangular-shaped sleeves with narrow openings for the hands. These sleeves attached to long, straight lengths of cloth composing the body of the robe. A relatively wide, flat collar and lapels were sewn to the inner edges of the body panels at the front of the garment. This article of clothing conforms to the present-day kimono. Male dress of the Heian period retained the narrow, round tunic-like collar reflecting the earlier period of influence from the Asian mainland, and men also wore a skirt-like trouser and an underrobe or two. Sleeve shape departed from previous mainland models in that a square or rectangular shape came to dominate, and a single sleeve could be as wide as the entire body of a garment. In the wearing of such a robe, the bottoms of the sleeves, which were unsewn at their extremities, could practically sweep the ground. It is also during this period that family crests are thought to have first appeared on clothing. Some Heian costume types have persisted to the present day as seen in imperial court wear, religious dress, and costumes of the No theater. During the latter part of the twelfth century, the base of power in Japan shifted away from the increasingly decadent, self-absorbed imperial court in Kyoto to provincial military clans who chose the town of Kamakura as their headquarters. There are few extant garments from the Kamakura era (1185-1333), and the period literature is not very rich on the subject of costume. However, well-detailed surviving paintings do give an idea of dress at that time. Women's clothing was less encumbered by exaggerated multilayering, and large-scale dyed patterns appear on some female outer robes. Pattern-dyed designs were to become one of the most important creative expressions in later Japanese dress. Expressions of originality in men's clothing also began to be manifest through the use of outscaled motifs and the splicing together of pieces from two completely different robes in order to create a startling new costume. Buddhist sects (such as Zen), previously unknown in Japan, were introduced from the Asian mainland, which resulted in the importation of kesa made from certain luxurious types of textiles otherwise unavailable to the Japanese. Earlier kesa were, on the whole, more humble in appearance. The imperial city of Kyoto became the capital again with the advent of the Nambokuchô era (1333-1392), a period marked by clashes between rival military clans. Warfare continued during the subsequent Muromachi period (1392-1568). Since the advent of the Kamakura era, the imperial family had ruled in name only; the shogun, as the supreme military power, wielded the real power. In regard to cultural matters, the imperial court ceased to be in the vanguard. Elite members of the military class and high-ranking Buddhist monks were the leading practitioners of the newly established and extremely aesthetic tea ceremony. The shogun Ashikaga Yoshimitsu (1358-1408) was the first important patron of the No theater. Costumes of the No theater continued to exist in a wide variety of different types through the early twenty-first century. During the initial centuries of the all-male theatrical form, actors wore garments donated from the wardrobes of their elite patrons. By the Edo period (1603-1868), No costumes were being made specifically for use on the stage; however, for the most part the costume styles did not change and continued to reflect the clothing of earlier periods. Within the broad category of No robes called ôsode, a term referring to tall and wide sleeves that are left unsewn at their ends, are certain types of robes long since obsolete in Japan, except within the most conservative and traditional spheres of Japanese life, such as imperial court rites and Shinto rituals. Often making use of gold threads in the form of flat, gilded narrow strips of paper, along with silk threads, ôsode costumes always have woven designs. These designs can be quite bold in scale and composition, though their coloration is more reserved, usually limited to just one color for the silk. The No theater also preserves the skirt-like trousers (hakama) of earlier times, and the layered wearing of costumes, with an ôsode robe typically worn as an outer robe. The other principal category of No costumes features robes with sleeves shorter in height and width relative to ôsode sleeves. The sleeves are also rounded off at their bottommost outer edges rather than having a right angle as in ôsode. Sleeve ends are sewn up, allowing just enough of an opening for the hands to pass through. The name for this general category of No costumes is kosode. The same term had been used for the plain silk robe worn next to the skin and under layers of voluminous garments in the Heian period. During the Muromachi period, the kosode literally emerged as acceptable outerwear. What had previously been private intimate wear was now permissible outside of domestic interiors. This form of dress became the principal vehicle for the expression of changing fashions and styles. During the Edo period, most kosode-category costumes still preserved Muromachi and Momoyama period styles. Archaic styles that persisted included the use of heavy, ornate brocade fabric, extensive gilding, the splicing together of two completely different kinds of fabric in one robe, and an empty-center composition that concentrates the design motifs at the shoulders and hem of the robe. Such costumes did, however, change their over-all sleeve shape from oblong to squarish in response to an Edo period trend, and certain No robes with embroidered designs were occasionally influenced by contemporary fashion styles. Extant No costumes date as far back as the latter part of the Muromachi period. No robes were still being made in the early twenty-first century, and some of the modern producers made use of traditional hand weaving and natural dyeing techniques. For the purpose of providing comic relief from the tragedy and melancholy of No, kyôgen plays were traditionally performed along with No plays. Costumes for kyôgen reflect lower-class dress and are made of bast fibers (usually hemp or ramie) rather than silk, use no gold threads or gilding, and are patterned by means of dyeing-unlike No robes with their woven, embroidered, or gilded designs. Extant kyôgen costumes do not predate the Edo period. In the 1540s, when the first Europeans reached Japan, the country was in the midst of protracted civil war. This combination of turbulent times and a new wave of foreign influence led to the creation of some astonishing examples of samurai-class dress. Western-style tailoring and the newly imported "exotic" fabrics of European woolen cloth, Indian cotton chintz, and even Persian silk tapestry can be seen in several extant jimbaori (a type of vest worn over armor). Further creativity in male dress is evident in some short kosode-shaped garments (dôfuku) associated with the leading military figures of the sixteenth century. These robes exhibit unconventional motifs and surprising color combinations. Three successive military leaders were to emerge as unifiers of war-torn Japan. An enduring peace was finally established by the last of the three, Ieyasu Tokugawa. A new capital was established in Edo (later known as Tokyo), and all of the subsequent shoguns were supplied by the Tokugawa clan ruling from Edo while the imperial court remained in Kyoto. Japan entered a period of isolation, during which time the new religion of Christianity was suppressed, travel to and from Japan was prohibited, and foreign trade came under strict controls. Conservative dress became the norm for the samurai class. Men's formal wear consisted of a short vest with winglike shoulders and the traditional hakama, with both garments made from a bast fiber patterned with tiny repeat motifs and invariably dyed blue. The samurai had no more wars to fight, though armor and its associated vest continued to be made. Although creative examples of the vest were still produced, samurai were not encouraged to dress like dandies. The greatest creativity in dress during the Edo period was manifest in the kosode. Much of the impetus for transforming this garment into such a fashion-conscious form of dress came from the newly rich merchant class, which was, nevertheless, at the bottom of the social hierarchy. Whereas the No theater was the preserve of the upper classes, Kabuki theater was the performance art for the nouveau-riche merchants. Most Kabuki costumes have the standard T-shape of kosode; however, their coloration tends toward the garish and their design motifs can be overwhelming in scale. For example, a giant lobster might cover the entire back of a robe. Leading Kabuki actors (also an all-male theatrical form) became wildly popular, their faces and dress disseminated in myriad woodblock prints. However, their costumes tended to be too outlandish to influence fashion, other than by popularizing a particular shade of a color or a certain motif. Kabuki costumes of the early twentieth century continued to resemble those of the Edo period. Buddhist clergy ranked high on the social scale and were given administrative powers and official support under the Tokugawa government, enabling them to share in the general prosperity. The most unusual tendency seen in kesa, the patchwork garment, was a pictorial impulse that resulted in examples being woven, embroidered, or painted with such narrative representational imagery as birds and animals in landscape settings, gatherings of divinities, and even flower arrangements. Two of the methods used to satisfy token adherence to the patchwork tradition involved the stitching of cording or the drawing of lines onto the garment in order to create the impression of a pieced construction. As the kesa is a flat, wide, horizontal-oriented, usually rectangular-shaped garment, an inspiration for this new style in surface design was quite likely to have been the broad painted screens widely in use during the Edo period. The kesa also reflected fashionable taste in a more indirect way as a result of the custom for lay Buddhists to donate valuable clothing to temples. The garments would be unstitched, cut up, and remade into Buddhist robes. Other kesa were assembled from rich brocades, which were being woven domestically, as the Japanese textile industry had, by this time, absorbed the foreign skills and technology necessary for the weaving of luxury textiles. The extravagant tendencies in kesa led at least one Buddhist sect to make an austere, monochromatic, unpatterned vestment in a bast fiber. Although there were no new innovative styles, kesa-in the early 2000s-reflected all of the variety seen in the Edo-period examples. However, several early twenty-first-century textile artists in the West have made creative works inspired by the traditional form of the kesa. Japan was forced to end its isolation in the 1850s when Western powers with advanced military technology demanded trading concessions. The Tokugawa Shogunate collapsed, and power shifted to the imperial family, which moved the court to Tokyo in 1868 and proclaimed a new era, the Meiji (1868-1912). Once again, the Japanese realized the need to keep pace with more developed nations, and embarked upon a policy of rapid Westernization. Western dress was adopted, with the emperor and empress helping to set an example for the rest of the country by occasionally wearing Western clothing. Buddhists and elite samurai families sold off quantities of kesa and No costumes, ultimately enriching museum and private collections in Japan and the West. For the more sophisticated urban population, and especially men, traditional Japanese dress ceased to be a part of everyday wear until eventually the use of traditional dress was relegated to Buddhist temples and monasteries; Shinto shrines; No, kyôgen, and Kabuki theater; tea ceremony and other traditional arts such as flower arranging; and the imperial court. Geisha, still an institution in Japan at the start of the twenty-first century, were still expected to entertain in kimono. In the early 2000s, rites of passage such as children's coming-of-age ceremonies, school graduations, and weddings are occasions for members of the general public to wear traditional dress. A Japanese family also might don kimono when participating in special national and regional festivals or when relaxing after bath time at a traditional inn. It was not uncommon for a Japanese housewife to attend kimono school in order to better understand how to select and properly wear a kimono and its most important accessory, the obi. During the Meiji period, terms were coined in order to distinguish the old Japanese way of dressing (wafuku) from the newly adopted Western dress (yofuku). Kimono (derived from the verb for wearing clothes and the word for "thing") became the new term for the T-shaped garment formerly known as the kosode. The word has entered the dictionaries of languages the world over and commonly serves as the designation for the national dress of Japan, just as "sari" is universally recognized as the timeless Indian garment. During the early Taishō (1912-1926) and late Taishō (1926-1989) periods, the mingei movement was founded by artists and intellectuals for the purpose of preserving and perpetuating the folk crafts of Japan, especially as practiced by farmers and ethnic minorities. Those who championed the idea of mingei can be thought of as the East Asian inheritors of the Arts and Crafts movement, although they did not have to insist on the importance of handicraft, as did their Western predecessors, because in the traditional Japanese distinctions between fine and decorative arts were not emphatic. However, the elevation of handcrafted works made by simple-living country people and minorities on the fringe of Japanese society did not fit with conventional ideas of social hierarchy in Japan. Examples of costumes collected and studied by mingei enthusiasts include the bast fiber and cotton robes of the indigenous Ainu tribe, specially dyed costumes from Okinawa, heavily stitched farmers' jackets, and fishermen and firemen's garb. See also Kimono; Japanese Fashion. Bethe, Monica, and Iwao Nagasaki. Patterns and Poetry: Nô Robes from the Lucy Truman Aldrich Collection at the Museum of Art, Rhode Island School of Design. Providence: Rhode Island School of Design, 1992. Bethe, Monica, and Sharon Sadako Takeda. Miracles and Mischief: Noh and Kyôgen Theater in Japan. Los Angeles: Los Angeles County Museum of Art, 2002. Dalby, Liza Crihfield. 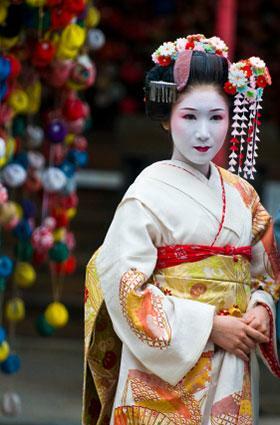 Kimono: Fashioning Culture. New Haven, Conn.: Yale University Press, 1993. Dusenbury, Mary. "Textiles." In Kodansha Encyclopedia of Japan. Vol. 8. Tokyo: Kodansha International, 1983, 16-20. Kennedy, Alan. Japanese Costume: History and Tradition. Paris: Editions Adam Biro, 1990. Kirihata, Ken. Noh Costumes. Kyoto: Kyoto Shoin, 1993. Liddell, Jill. The Story of the Kimono. New York: E. P. Dutton, 1989. Matsumoto Kaneo, ed. The Treasures of the Shôsôin: Musical Instruments, Dance Articles, Game Sets. Kyoto: Shikosha, 1991. Minnich, Helen Benton. Japanese Costume and the Makers of Its Elegant Tradition. Tokyo: Charles E. Tuttle, 1963. Noma Seiroku. Japanese Costume and Textile Arts. New York and Tokyo: Weatherhill/Heibonsha, 1974. Yamanobe Tomoyuki. Textiles. Rutland, Vt., and Tokyo: Charles E. Tuttle, 1957.